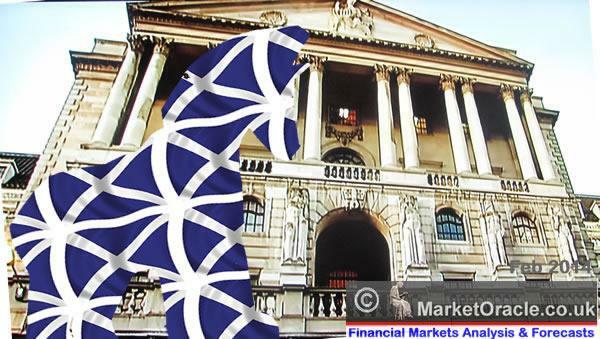 British Pound Slides on Scottish Independence YES Vote Risks, What Happens Next? The British Pound has virtually nose dived after spending the whole of the year in an uptrend to recent multi-year highs of £/$1.72 of mid July on the back of a strong UK economy when compared to the Euro-zone catastrophe that continues to unfold across the English Channel, which had prompted much flight of the capital to the relative safety of the British currency. Since early August, forex market attention has increasingly been turning towards the risks of a YES Vote in the Scottish Independence Referendum that risks blowing apart one of the few Islands of stability in a world of chaos. Up until recently it was assumed that Scotland would vote NO, but in the feverish build up to the September 18th vote, and the intensity of propaganda flying around has prompted much confusion as to the probable outcome of the vote which has prompted the forex markets to start discounting the likelihood of a YES vote that would trigger much flight of capital out of the UK. However, as my series of articles on Scottish Independence have highlighted that the probability of a YES vote is very small, less than 25% as leaving aside the Scottish Fanatics, the vast majority of Scots, at least 75% realise the huge subsidy that England delivers them annually to stay within the Union, so will in all probability vote NO to contine to ride on the English subsidy gravy train. 02 Sep 2014 - Independent Scotland Currency, Plan A, B, C or D - British or Scottish Pound?